1. Keep Hard Cheese Fresh – Before you store your hard cheeses in the fridge, rub the wedge with butter or spray it with non- stick cooking spray and then wrap it in plastic wrap. The oil will create a protective layer that will prevent it from drying out. 2. Prevent Brown Sugar From Hardening – When storing, put a piece of orange peel with it in an airtight container. If it is already hardened, you can microwave it with a damp paper towel in the container with the lid off for 20 seconds and it will soften right up. 3. Keep Mushrooms Fresh – Take your store bought mushrooms out of that container covered in plastic wrap and store them in paper bags to significantly extend their life. To keep them from drying out and stay fresh even longer, wrap them in a damp paper towel to keep the moisture in. 4. Check to See if Eggs are still Fresh – Fill a bowl with water and place the eggs in, if it sinks you are good to go, floaters should be discarded! Over time, the liquid inside eggs evaporates through the semi-porous shell, leaving a gas bubble inside. The floatier it is, the older it is. 5. Keep Your Guacamole From Turning Brown – Place your guac in a container that has an airtight seal and slowly add water to cover the top layer of the guac completely. Its good for up to 3 days in the refrigerator. When ready to eat, pour out the water and stir. 6. Give Sour Cream a Longer Shelf Life – Store your sour cream upside down to keep it fresher longer, flipping it creates a vacuum which helps to prevent bacteria from forming. 7. Keep all your Herb Fresh for Weeks – I store all of my fresh herbs in an Herb keeper, the best thing ever invented! It literally will keep my parsley and cilantro fresh for almost two weeks. 8. Peel that papery skin from ginger – Ditch the peeler when removing ginger skin. To peel the root use the edge of a teaspoon, it works like a charm. 9. Quickly scoop out squash seeds – Remove seeds from vegetables such as squash and pumpkin with an ice cream scoop. Because the edge of the scoop is sharp, it cuts through the fibery gooey stuff inside the squash easier than your hand or a regular spoon will. 10. Skim the fat – Spoon out excess fat from stocks, stews, and sauces by skimming a few ice cubes wrapped in a paper towel or cheesecloth along the surface of the liquid. The ice helps the fat solidify, making it easier to remove with a spoon. 11. Peel garlic the fuss-free way – Remove all cloves from the bulb, then whack each clove with the side of a chef’s knife. The skin will fall right off. 12. Pit stone fruits with a twist – Cut stone fruits, such as plums and nectarines, into two halves, then twist the halves in opposite directions. Use your thumb to pop out the pit (if your thumb doesn’t do the job, gently pry it out with a butter knife, or cut the fruit into quarters for easier separating). 14. Remove pomegranate seeds (without dying your hands red) – Cut a shallow cone into the flower end of the pomegranate, then slice off the bottom of the fruit. Score the fruit along its membrane and pry each section apart to reveal the seeds. Do this in a bowl of water to prevent the juices from squirting out. 15. Make cheese grating easier and less messy – Before grating semisoft cheeses such as fontina and fresh mozzarella, try freezing them for about 30 minutes and save yourself a big mess. 16. Measure sticky stuff without the mess – Coat a measuring cup or spoon with hot water or a dab of cooking oil (or spray) before measuring sticky substances such as molasses or honey. The heat or oil will help it slide right off and into a mixing bowl without leaving any behind. 17. Cut cherry tomatoes in half all at once – Cut cherry or grape tomatoes in half with ease by placing them between two plates or lids. Gently slice horizontally through the bunch of tomatoes while pressing down the top cover for perfectly halved tomatoes. 18. Cut the (soft) cheese with ease – Slice soft cheeses such as brie and goat cheese with unflavored dental floss to avoid smashing them. This trick also works for cake and cookie dough logs! 19. De-crystallize honey – Bring new life to crystallized honey by placing the container in a bowl of hot water for five to 10 minutes. 20. Don’t waste your time flipping – Now don’t flip out on me, but you don’t always have to flip your food. When roasting items such as French fries and veggies, pre-heating your baking sheet eliminates the need to flip halfway through. This method isn’t suggested for baked goods like cookies! 21. Cook a whole bird evenly – When cooking an entire turkey or chicken, ice the breast of the bird to lower its temperature. Since the dark thigh meat needs more time to cook than the white breast meat, chilling the breasts will promote even cooking. 22. Use parchment paper for muffins – No muffin liners? No problem! Use 5-inch squares of parchment paper instead. To help the paper stick better, spray each muffin well first. Then press the squares into each hole, folding the sides as needed to create flat walls, fill with batter and bake. 23. 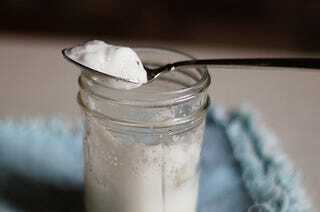 Foam milk without a frother – So maybe you don’t have a fancy-schmancy espresso machine with attached milk steamer. All you need is a small jar with a lid. Fill the jar with a little milk (no more than halfway) and shake what your mama gave you until the milk has doubled in size. Pop off the lid and microwave for about 30 seconds. 24. Save fresh herbs for later use – Use an ice-cube tray or muffin tin to freeze fresh chopped herbs in water, olive oil, or stock for then use as a seasoning agent. 25. Chill wine and cocktails without diluting – Don’t let ice water down your cocktail or wine, cool down a fresh glass of wine or a fancy cocktail by plopping a few frozen grapes in your glass. 26. Keep rice ready for each meal – Get dinner on the table even quicker by keeping cooked rice in your freezer. You can prepare rice in advance in large quantities, portion it out and then freeze it for up to 6 months. 27. Steer clear of ice cream freezer burn – Place a piece of wax paper over ice cream before putting the lid on and back in the freezer. The barrier will help prevent freezer burn! 28. Easily cut meat into thin slices for stir-fries – While the veggies are easy to slice, it’s tricky to produce thinly sliced chicken or beef—unless you partially freeze the meat before cutting it. I just pop in the freezer for 30 mins or so and I am able to get evenly sliced strips. 29. Extend nuts’ shelf life – Freeze shelled nuts to preserve their natural oils (which may go rancid at room temperature over time). 30. Cooldown coffee without diluting it- Fill an ice cube tray with leftover coffee (cooled to room temp) and let the cubes set in the freezer. The coffee cubes will keep an iced cup of joe from becoming watered down. You can even customize the cubes by adding milk and sweetener. 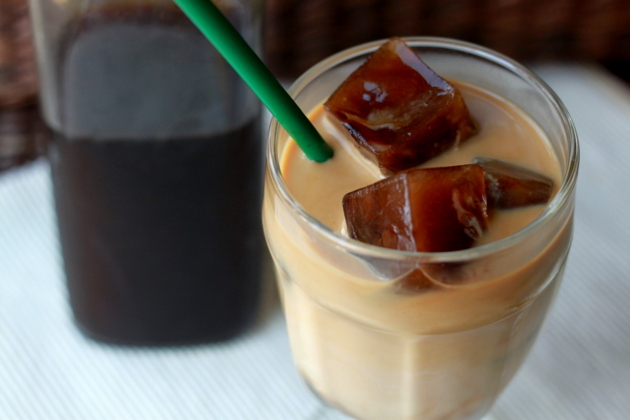 This is great when you want a quick ice coffee from home! 31. Remove icky cooking smells from your hands – Neutralize garlic or onion scented hands by rubbing them with lemon juice, baking soda, or stainless steel. Why stainless steel? When you touch the material, the molecules in the steel bind with the stinky causing molecules (such as sulfur from garlic). 32. Clean fruit and veggies without harsh chemicals – Scrub fresh produce with a mixture of baking soda and water to remove grit, grime, and pesticides. 33. De-crust a microwave – Soak a sponge in water, pop it in the microwave, and let it cruise around the turntable for a minute. This steam loosens all that caked on stuff inside the microwave making it easier to wipe away after, plus it helps to disinfect the sponge too! 34. Clean cast-iron without causing rust – Scrubbing cast-iron with soapy water is a no-no, it’ll strip away the protective seasoning on the pan built up from cooking. Typically you would wipe out the grease from the pan after cooking, but to remove stuck-on bits of food clean with a coarse salt scrub. Use a cloth and tablespoon of salt and scrub, scrub, scrub! 35. Keep wooden cutting boards looking new – Scrub a wooden cutting board with coarse salt and massage with half a lemon to clean away food particles and food smells. Rub the board with food-grade mineral oil to condition the wood once a month. Its such as you read my mind! You seem to understand a lot approximately this, like you wrote the e-book in it or something. I believe that you simply could do with some percent to power the message home a bit, but other than that, this is great blog. A great read. I’ll definitely be back. Wow! I can – and will – use every one of these “hacks” thanks for a great post!